Yes, you have read that right! You can now curb your chaat cravings without feeling too guilty while indulging. Curry Leaves- 6 to 7 nos. 1. Wash and drain the soaked peas. Add a little salt and pressure cook the peas for 4 whistles. 2. Heat a non-stick pan and add the mustard seeds, curry leaves, and hing to it. Dry roast for a few seconds. 3. Now add the turmeric and chili powder, ginger-green chili paste, jiggery, and tamarind pulp into the ragda and mix well, while mashing the peas lightly. 4. Add 1 ¼ cup of water and cook till the gravy turns slightly thick. 5. Simmer for five minutes and keep aside. 1. Mix the mashed potatoes, corn flour, and salt together in a bowl. 2. Divide the mixture into 8 equal portions and keep aside. 4. Cook the patties on a non-stick pan till they are golden brown on both sides. 5. Keep the patties aside. 1. 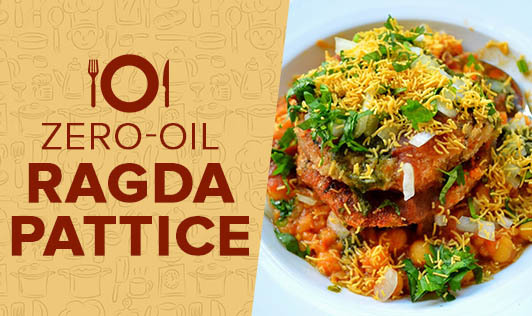 Place 2 patties on a serving plate and top it with ragda. 2. Pour 2 tablespoons of khajur imli chutney, 1 tablespoon of green chutney, and 1 tablespoon of chopped onions on the top. 3. Garnish with fresh coriander and serve hot.